Bhubaneswar:27/8/18: “Poetry is a mixture of everything – love, betrayal, sorrow, happiness, loneliness and materialistic life. Living with poetry is more important than writing it down,” said Akhil Kumar Mishra at the launching ceremony of his maiden poetry collection ‘The Painted Silence’ here on Sunday. On the auspicious occasion of Rakhi Purnima, city-based publication house Timepass organised ‘Pushtak Parva (book festival)’ at Hotel Keshari. Poet Pabitra Mohan Kar presided over the meeting while poet Saroj Bal, also the publisher, welcomed the esteemed guests. Several other poets and literature lovers were present on the occasion. 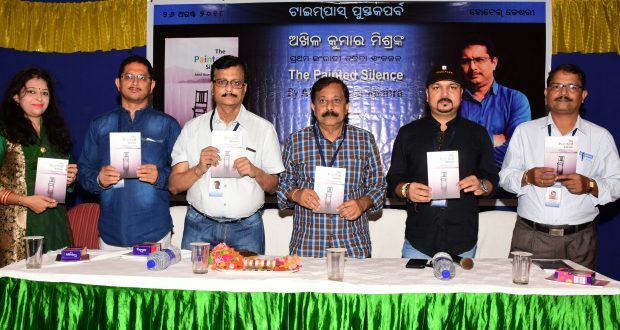 Akhil Kumar Mishra has penned five poetry books in Odia and ‘The Painted Silence’ is his first collection of poetry in English. Mishra is a career civil servant who joined Allied Services in 1999 after being allocated Indian Information Service, Gr A.